As part of an Asian product launch event, Nokia announced the 2875i. Another CDMA handset that wasn't specificaly targeted at Asia was also announced at the event, the Nokia 6275i. Features of the device are very similar to the 2865i, which was announced this year at CTIA. 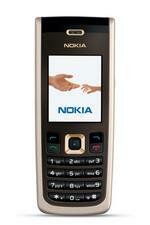 The Nokia 2875i should begin shipping during the 4th quarter of this year.